عرفت المطعم من ٢٠٠٦ تقريبا، ومستحيل يمر شهر دون ما أكون أكلت منه. 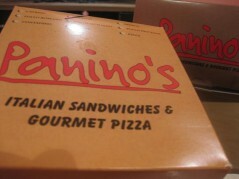 Panino's is the bridge between fast food and full service restaurants. Unlike the fast food community, we use only fresh ingredients of the highest quality to make our signature hot grilled sandwiches, salads, and pizza. Everything is made fresh daily, especially our special bread which is prepared and baked three times a day! In our commitment to quality and dedication to service, we are able to meet the expectations of a full service restaurant with the speed and price value of a fast food concept. 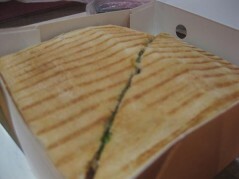 Is Panino's just a hot, grilled, delicious sandwich? Absolutely not! There is a selection of fresh salads (including the award winning San Remo pasta salad), hot thin-crusted pizzas, desserts, and beverages. The one thing in common is the passion and dedication to using the best quality ingredients in everything we do. C صحارى مول اضغط هنا لعرض صفحة مخصصة للفرع وبياناته بالتحديد. C المملكة اضغط هنا لعرض صفحة مخصصة للفرع وبياناته بالتحديد. C شارع الثلاثين اضغط هنا لعرض صفحة مخصصة للفرع وبياناته بالتحديد. C بانوراما مول اضغط هنا لعرض صفحة مخصصة للفرع وبياناته بالتحديد. C Aziz Mall اضغط هنا لعرض صفحة مخصصة للفرع وبياناته بالتحديد.